Olallieberry blackberries are shiny black fruit that were first developed in 1949 by the U. S. Department of Agriculture at Oregon State University by crossing a Loganberry with a Youngberry each of which is itself a cross between blackberry and another berry (raspberry and dewberry, respectively). The result was called the Olallie, a Chinook Native American word meaning blackberry. The original cross was made in 1935 by George F. Waldo with the United States Department of Agriculture Agricultural Research Service, who ran the cooperative blackberry breeding program between the USDA-ARS and Oregon State University cooperative breeding program. Selected in 1937 and tested in Oregon, Washington and California as "Oregon 609", it was renamed "Olallie" and released in 1950. Physically the Olallieberry looks like a classic blackberry. 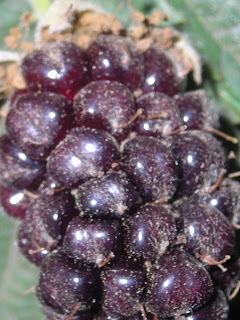 Genetically, however, the Olallieberry is approximately two-thirds blackberry and one-third European Red Raspberry. Eaten fresh, Olallieberries are excellent, however most are made into preserves and wine. Like Blackberries, Olallieberries are super healthy for you. Anthocyanins - Olallieberries are characterized by one major pigment: cyanidin-3-glucoside and in some cases cyanidin 3-rutinoside. The total anthocyani concentration is reported as 148 mg/100 g fruit. Phenolics - Similar to raspberries, Olallieberries are relatively high in the phenolics, hydroxybenzoic acid and chlorogenic acid. Fiber - Olallieberries are high in fiber (5.3 g/100 g,)which has been shown to help reduce the risk of certain cancers.